C contains protons and neutrons. 2&3. Look at this diagram of an atom of a common element. 2. What is the atomic (proton) number? 3. What is the mass (nucleon) number? A). the same number of protons but different numbers of neutrons. B). the same number of protons but different numbers of electrons. C). the same number of neutrons but different numbers of protons. D). the same number of electrons but different numbers of protons. A). will eventually gain electrons through bonding. B). will become stable by cooling down. C). is unstable and will ‘decay’ by losing particles. D). is not found naturally on the Earth. 6. 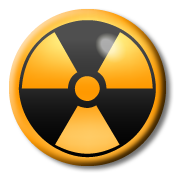 Which of the following best describes the words 'contamination' and 'irradiation'? Questions 7-9 are about types of radiation. Which type(s) of radiation match the following descriptions? 10. When Uranium decays it emits an alpha particle, forming an isotope of Thorium. Which of the following decay equations is correct? 11. What change takes place to an atom during beta decay? A). A proton changes into a neutron. B). A proton changes into an electron. C). An electron changes into a neutron. D). A neutron changes into a proton. 12. In this decay equation, what are the missing numbers x and y?